YoruYume here and I’ll be posting my review of one of my top 10 anime! “The Melancholy of Suzumiya Haruhi”! The story is about the protagonist whose name is Kyon and as he enters high school with thoughts of aliens, time travelers and espers being non-existant in this world. During the introduction of his new classmates, he met this beautiful and eccentric girl whose name is known as Suzumiya Haruhi. She apparently says that she has no interest in ordinary humans but she’s looking for espers, time travelers and aliens. 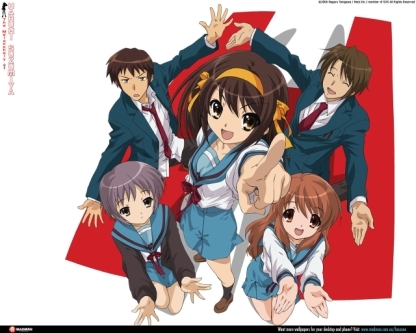 After which Kyon came to knew Haruhi better and he got forced to join a club called “SOS Dan” Made by Suzumiya Haruhi. Later on, a few members joined the SOS Dan.. but it turns out that the members who joined are not really humans. Nagato Yuki is a literature club member however her real identity is an alien. Mikuru Asahina is a upperclass man who has a shy personality and she is a time traveler. Koizumi Itsuki is a mysterious transfer student and his real identity is an esper..and thus Kyon’s fun life begins.. Weird plotline but still likeable ^^. The only thing that lacked in the anime is the art. I can say that the graphics of the anime isn’t actually that good, but it still acceptable. The anime seemed like it’s lacking a bit of emotions for the characters. The way some characters are drawn isn’t that good either. Generally, i enjoyed this anime very much because of the confusing plotlines as well. Recommended anime for all those people out there who are looking out for weird animes XD.